“Focus on the positive, focus on the positive!” Pilgrim muttered to himself. Pilgrim’s anger and frustration re-boiled to the surface at that last thought. Pilgrim sighed. He was better than this. Time to face the facts and push the emotions aside. Yes, he lost his Tengu during a pirate raid gone bad. Yes, it had been a LONG time since that had happened. But these things do happen. Being an immortal capsuleer means that you outlive a lot of ships and a lot of crews. It is unfortunate, but it is a fact of life. The ship and its equipment, and even its crew are all easily replaced. “Perhaps too easily.” It was expensive, but Pilgrim knew he could afford to lose that Tengu several times over. It was more of a mental blow than a financial one. Yes, he would have to re-bond with a new ship, but that only took about 4 days. Not that long really. And no, he wasn’t seriously considering flying anything else. Not long-term anyway. Pilgrim stretched out in his quarters and replayed the events in his mind. He remembered the excitement of hitting each pirate site. He had blown through each of them so quickly. He landed at the final site and burst through the acceleration gate. There were only a handful of ships on grid and none of them were threatening. He destroyed about half of them and then saw the structure that was his objective. As the first of his missiles hit the structure, more ships appeared. Pilgrim paused in his remembrance. There. That was his mistake. He should have cleared the most dangerous of those ships immediately. Instead, he continuing destroying the structure and several more waves of ships landed on grid. True, his intel hadn’t mentioned anything about neuting ships. Or webbing ships. Or warp scrambling ships. But he should have been gathering that intel himself – not relying on others to provide it. He destroyed a couple of the neuting ships, but not enough of them and not quickly enough, and soon he was in a pod beside the wreck of his ship. Next time he would be more careful. Next time he would not be overconfident. Pilgrim walked out to the maintenance bay where his new Tengu was being assembled. His own mistakes aside, he was quite happy with the performance of his last ship and this one was being configured to those same specifications with only minor upgrades. The only thing this ship still needed was a confident captain and a new name. And Pilgrim had the perfect one in mind. This entry was posted in Industry, Pilgrim, Storytime and tagged storytime, Tengu on August 21, 2014 9:52 pm by Pilgrim in Exile. Scanning and Puzzles and Treasures, Oh My! This past Saturday was the Newbie Treasure Hunt. Participation was fairly light, but on the positive side all of the participants made out pretty well. The first part of the event had me sending an Eve mail to the participants identifying the starting system. I had them stage 3 jumps away so they got there pretty quick. The next step was to scan down my ship. There was a bit of confusion because 1) there were several ships in the system, 2) I was 16AU from any celestial object. So in local, I gave some additional instructions on where to find me. Pretty quickly, combat probes starting showing up on my dscan and after a couple more minutes, the first pilot arrived. After that if flowed pretty quickly, although one pilot didn’t have secure containers on his overview and thus could not see them in space. We got that corrected and soon all of them but one had come and gone. As a bonus for the first pilot to find me, I dropped a can with T2 rig BPC’s worth about 15-20M ISK. But I forgot to abandon the container! The first 2 pilots to find me were in Astero’s. They probably made the wise decision to not flag themselves by taking the loot. Possibly they thought it was a trap. All the rest of the pilots seemed to assume the can had already been looted. However, the last pilot to find me noticed the loot and helped himself. He was immediately flagged yellow (and I realized my mistake). He then grabbed his bookmark and headed out. I checked the killboards and didn’t see him getting killed, but I tipped him 50M ISK for his bravery and to alleviate my conscience. The winner notified me about 1 hour after the start of the race that he had finished it and won the Astero. He had a small bit of difficulty in claiming his prize due to EVE not recognizing the BPC in the contract, but we straightened it out quickly. The winner was Eadwig ofHelmsby. He actually managed to be the first player to both of the two treasure locations (about 10 jumps apart). He walked away with an Astero, Sisters Core Probe Scanner, and some Sisters Core Probes. He also picked up an Astero BPC, but he was gracious enough to share that with the second place player. The last player (assuming he didn’t die) probably made out 3rd place in loot with the BPC’s and the 50M tip. I think the lowest any player got was about 10-15M isk total. Everyone seemed to have a pretty good time. In retrospect, I would have done a few things differently. First, I way overdid security at the start of the race. Sending out pilot specific containers with password pairs was a lot of work and definitely overkill. Also, if I want to run a big event (and I probably don’t), I need to reach out to established corps to help me promote it. Here’s the funny thing – veteran EVE players came out of the woodwork to donate prizes. However, when I tried to promote it in Tas Exile’s newbie NPC corporation and local in a couple of newbie areas, I was immediately (and loudly) suspected to be a scammer!!! I suppose EVE’s reputation works against it here. Also, the puzzles were way too hard for the time period. In fact, I am pretty sure the puzzle cans are still out there with about 20M worth of loot in them. Care to take a crack at them? Leave an answer in the comments. Anyway, thanks to all who participated and helped me promote it. Special thanks to Katia Sae (of “To Boldly Go“) who donated an Astero and to Mynxee (of “Outlaw Insouciant“) who made a generous ISK donation. 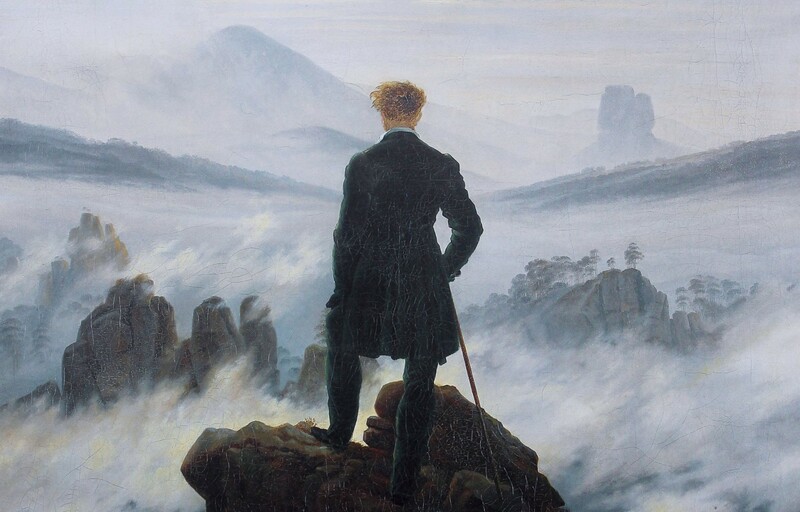 This entry was posted in EVE and tagged treasure hunt on August 19, 2014 11:01 am by Pilgrim in Exile. This is pretty classic attempt at a monopoly. 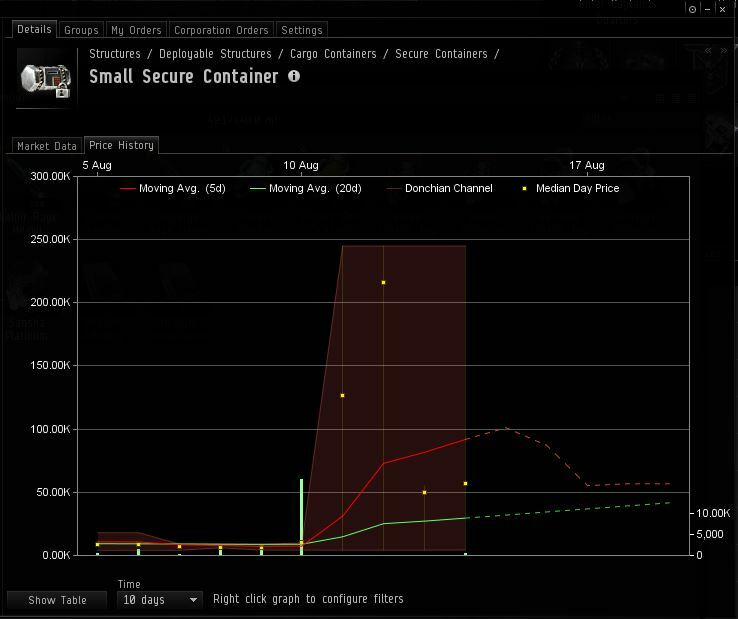 Judging from the spike in the first graph, it looks like somone bought up all of the small secure containers in Jita. They then relisted them at about about 25x the price. It was like this for a few hours before somone jumped back in with a a stock of containers at a much lower price (although still 5x the previous baseline price). It is pretty hard to monopolize the market for very long. Small secure containers are easy to produce. I am not sure how long they kept up the monopoly or how much isk they made (or lost) in doing it. I only noticed this because I was finishing up my treasure hunt containers and thought I needed a couple more. Fortunately, I had already purchased what I needed (on another character). I actually had enough to relist some on the market, but I didn’t. I wanted to hold onto my extras just in case. If you want to sign up for the treasure hunt, I still have a few spots left. Send an ingame mail to Tas Exile as soon as possible. I relaxed the entry requirements for a couple of players that were just outside the window of character age. So if you are close and want to participate, let me know. 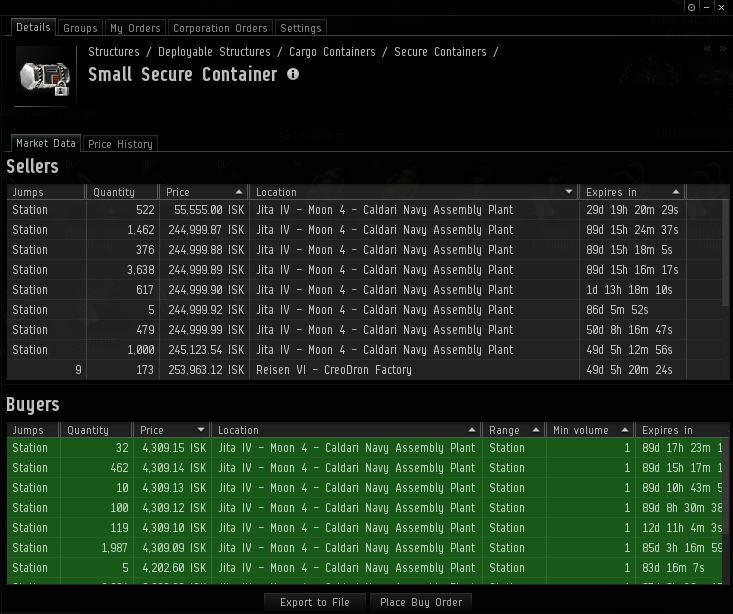 This entry was posted in EVE and tagged market on August 14, 2014 3:49 pm by Pilgrim in Exile. I had played Diablo and Starcraft so when this came out, I investigated. It sounded pretty interesting. I am not really an early adopter so I didn’t actually get into the game until it was well established (but still pre Burning Crusade). A Dwarf Hunter. I liked the hunter class, but felt like Night Elf was way too cliché. I rolled him on a PVE server. He only made it to about level 30. After playing the hunter for awhile, I got a bit bored and wanted to try something else. I re-rolled on a PVP server and chose a druid. The only choices were Night Elf and Tauren, and I wanted to try the other faction. The Tauren druid was my first level 60 character. So many things! I loved the huge world and seeing the art design decisions come together for each area. The classes all had a unique feel to them. I loved the rhythm of hunter and pet. I loved the burst damage of an assassin rogue coming out of stealth. I liked the creative gadgets in Engineering and the various utility spells. Probably my favorite was the synergy of the early groups for running dungeons. Back when threat, healing, crowd control and communication all really mattered. The tank would pick up 2 primary targets and the dps/cc would all disable their targets and then focus fire the primaries. I really enjoyed that. 6. Do you have an area in-game that you always return to? Not really. I haven’t played for a couple of years now. Ironforge will probably always be my favorite city. I played for about 5 years from Vanilla through Wrath of the Lich King. I played just a bit on and off in Cataclysm and never saw Pandera. Yes. Most of the time. I liked quests where reading the text meant something. If I just needed to kill 10 rats then quest text was kind of a waste. On one hand, I regret playing so much. I wasted a lot of time doing it. Also, it pissed my wife off. On the other, I wish I could have raided more in Burning Crusade. I was playing mostly with a friend then and he wasn’t into raiding. For awhile it was one of my main hobbies. But I was too busy overall to commit the required schedule to raid and enjoy all those aspects of raiding. Other than, I read a lot my blogs now! If you want to read some of the other responses, please do so here. This entry was posted in Uncategorized and tagged WoW on August 13, 2014 10:39 am by Pilgrim in Exile. Ok, signups for this event are still in the single digits. I literally have more players offering additional prizes for the event than I do actual players for the event. SIGN UP! (if you are a new player that started between 1 Aug 2013 and 1 Jul 2014). Send an in-game message to Tas Exile to sign up. I am re-working the final stop in the hunt to have 2 winners. One wins some exploration stuff worth about 100M isk. The other wins an Astero! It is technically possible to win both, but you would have to be in the lead by a good margin. Along the way, I am adding some more loot to the cans. The values range from about 100k ISK to about 5M isk. I added about 20M isk worth of loot to the puzzle cans. I tried out the puzzles on a couple of people and they said they were too hard without context. So here are some hints. One is mathematical. One is musical. One is literary/poetic. One is religious/biblical. All but the literary/poetic one are pretty common in US/Western Europe. The literary/poetic one is less common, but should be known by fantasy/scifi fans. The training skills that you need to participate are minimal. Racial Frigate 3-4 and Astrometrics 3 should be plenty for the start. I will be in a frigate, but I will have my MWD on so I will be fairly easy to scan down. You need to be able to cargo scan. Cargo Scanner I only requires CPU Management 1. Using an MWD is probably the longest train, but you should have that already anyway. Any other questions or doubts? Please ask in comments. This entry was posted in Exploration, New Player and tagged New Player, treasure hunt on August 12, 2014 9:22 am by Pilgrim in Exile.